When you’re starting to sew, there is so much to learn! The machine’s needle seems like it should be such a simple thing, yet all the choices can be overwhelming. What’s your machine’s needle system? For my sewing machine, I had to go to the manual. All three of these machines work happily with the Organ needles from CTSUSA.com . 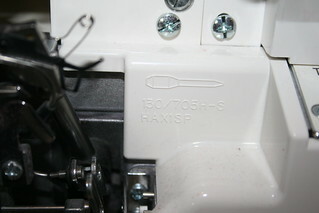 The sewing machine and serger both want 130/705H or 15×1/HAx1 household machine needles. The coverstitcher uses a different type, the slightly more expensive ELx705. 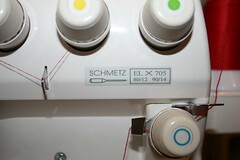 And, even though it says “Schmetz” on the machine’s label, I’ve never had any trouble with the less expensive Organ needles. 70/10? 80/12? 90/14? What are all these numbers? Machine needle size numbers indicate the needle’s width. Basically, the thicker the needle, the bigger the number. As a general rule, the lighter weight fabrics use smaller needles and heavyweight fabrics use larger needles. Why two numbers? The numbering comes from the combining of two size systems. 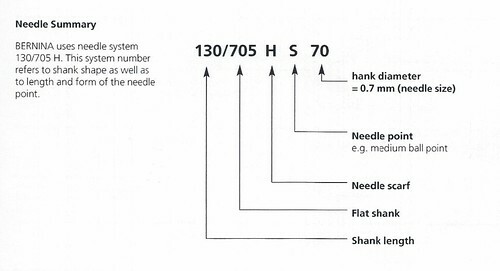 For the most common needles, European metric needle sizes number needles from 60 to 120. As shown in the image above, a size 70 needle indicates a shank diameter of 0.7mm. The American system numbered the same needles from 8 to 16. The American system reflects size in that a bigger number is a wider diameter, but the number does not correlate to a measurement like the metric system does. What you sew determines what size needle to use. For example, I use an 80/12 or 75/11 sharp when sewing together two cotton woven fabrics to make quilt squares. For t-shirts and leggings, I use an 80/12 ball point. For fleece, I’ve found a 90/14 ball point seems to give me better results than an 80/12. When sewing twill for a bag or pants, I use a 90/14 sharp. Heavier fabrics, bigger numbers. A ball point needle is used on knits or very loosely woven fabrics. The ball point will push aside the fibers of the knit rather than cutting through them. A sharp needle used on knit fabric will result in holes in the material. A sharp needle is used on woven fabrics. Since the fibers are more tightly woven together than in a knit material, they do not pull apart and make holes when the sharp needle pierces them. Using a ball point needle on a woven fabric will tear through and damage the fabric. A universal needle is similar to a sharp needle, but has a slightly rounded tip. There are many other types of needles, but for most sewing, having some ball point and sharp needles will get you off to a good start. This post contains affiliate links, but we’d recommend CTSUSA.com even without the affiliation because their needles are a great bargain!